If there's one thing that can be said about Halo 3's online mode is that it's full of...uh, an unsophisticated style of behavior. This won't be a problem for Halo 3: ODST's co-op modes, including Firefight, because unless you are friends with some dimwits - you won't be using matchmaking to fill a co-op game. “That was basically one of the limitations we had, that we couldn’t just add matchmaking for Firefight because it was based upon the cooperative Campaign gameplay. 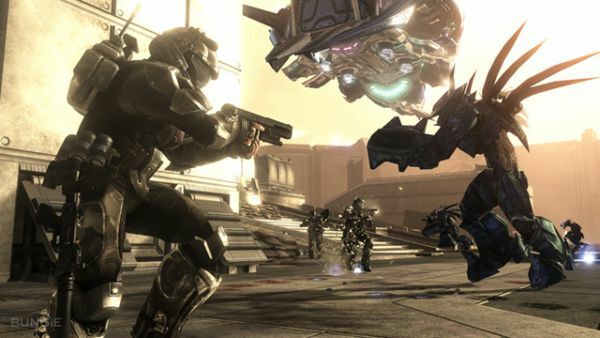 You'll still be able to form a party with friends and play through either the single player campaign or the Firefight mode in ODST, but if you are short a player you won't be able to utilize Xbox Live to fill in that missing slot. There's some PR spin to be had as well, saying the reasoning also had to do with a desire to regain that Halo 1 social experience. The college dorm room get together of Halo multiplayer, the LAN party in the dining room, and running a network cable up two stories to the apartment above. “It’s really trying to get back to that same sort of experience we had in Halo 1 multiplayer,” says Creamer. “Since there was no Live then and no matchmaking, you really had to get together with your friends, you know, have LAN parties at your house and have that cool social experience with your buddies all sitting together. Firefight is really all about getting together with your friends online and playing that way. I have some really fond memories of Halo 1 in college, in fact some of those methods of play I actually experienced. But those methods came to be because of a technical limitation of the day. One that shouldn't exist today. Is this a big deal to you Co-Optimers? Are you going to miss out on finding Firefight players to fill your party? Perhaps you can just look for other folks on our forums to meet up with!